Technological innovation in e-mobility transfers from Formula E championship victory into everyday motoring at Renault. Created three years ago, the FIA Formula E championship saw Renault confirm its supremacy. Since then, the performance and energy of Renault e.dams has been duly rewarded as the French squad was recently crowned FIA Formula E champions for a third consecutive season. They are currently the only team in the category who has won the teams’ title. During the first two seasons, Renault e.dams embraced the challenge of the Formula E championship from the outset, by winning the teams’ title on two consecutive occasions. Sébastien Buemi missed the drivers’ crown by only one point in the first season, but fought back even stronger in the second year and was crowned champion after a thrilling season finale in London. This year, Renault e.dams managed yet again to win the title thanks to a stunning level of consistency with six victories out of twelve races. They are the only team to have scored points in each race. With the squad very keen to reclaim their crown, the team and Sébastien Buemi were victorious at the opening round in Hong Kong. More wins followed in Marrakech and Buenos Aires. The team soon returned to winning ways in Monaco, where the Swiss driver started from pole position – his first of the season, and he remained unchallenged on the Monegasque track. One week later in Paris, Sébastien offered his first victory on home soil to Renault e.dams. He then added another victory to his tally in the second race in Berlin – his sixth in eight races. Meanwhile, Nico Prost allowed the team to get closer to the teams’ title by scoring valuable points in each round and was the only driver to have accomplished this impressive feat. The race for the title was very tight at the Montreal season finale as only 18 points separated Sébastien from his closest rival, Lucas di Grassi, as they approached the decisive weekend in Canada. Unfortunately, the team had a disappointing day on Saturday with Sébastien’s accident in free practice and his disqualification, while bad luck returned on Sunday with a tough race for both drivers. 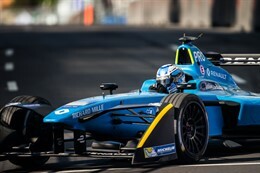 Renault; pioneers in electric vehicles, have been officially engaged as a technical partner for the inaugural Formula E championship since 2013. The impact of Renault went even deeper after they became the main sponsor of the e.dams team. Owned by Alain Prost and Jean-Paul Driot, their exciting, new journey opened up in September 2014 at Beijing. With this partnership, Renault fully invested in a new and particularly innovative discipline, with the will to show their double expertise in both motorsport and electric vehicles. The engagement and success from the championship are a massive boost in developing the electric range. Renault presents the Zoe eSport concept car at the Geneva show this year, which is an updated version of its success model, issued with the latest technologies from Formula E.
The FIA Formula E championship is innovative amongst other racing disciplines because of its close collaboration with fans worldwide. By investing in some of the most enthralling and dynamic cities, the wide reach of fans that are met takes the category to a new level. Formula E now features many high-profile manufacturers and is proven as a serious and well-respected category in the motorsport world. The announcement of Mercedes and Porsche into the championship for seasons 5 and 6 only confirms the enormous value of the discipline. Renault e.dams scored a total of 268 points to take their third crown. Sébastien achieved a total of 157 points with six wins, with Nico scoring 92 points.